As embarrassing as it still remains, Joe Hardy from Franklin W. Dixon's Hardy Boys mysteries. For those who've never heard the story, my earliest "crush" was on Joe back in first or second grade. My friend Sixten Otto introduced me to the current at the time paperbacks, and I was hooked. Anyway, I blame the Hardy Boys for making me the homo I am today. Ah, the good old Hardys, with their loyal, sporty friends, and honest midwestern values! 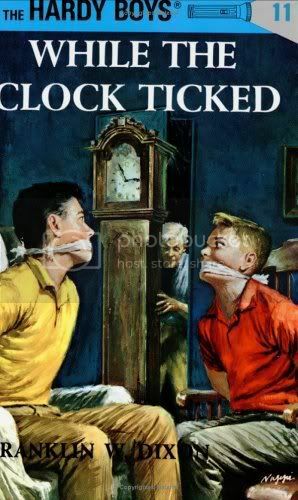 I assume you must be talking about the "Hardy Boys Casefiles" series being current when you were a kid, though, because the original books started coming out in the 1920s (the first edition of While the Clock Ticked was 1932). I always thought it was kind of fascinating how they progressively revised the books over the years to make them seem more current . . . and get rid of the racism, apparently. I'm still a huge fan of genre fiction, and as a kid I had a real love for this kind of fun, formulaic "mystery" story, so I read and enjoyed a whole bunch of Hardys (as well as a lot of Nancy Drews, which had lamer adventures but much better characters). It was also one of the first places I started to become aware of hacky, cliched writing, too, and realized that authors were sometimes lazy. The number of times the editions I read used phrases like "faithful chum Biff Hooper" or word-for-word recycled descriptions of the brothers REALLY became apparent when you wolfed down eight or nine of them from the library in a single week . . .